Forget Hansel & Gretel's candy cottage, Naples was building fortresses of food in the 18th century! This week, we're investigating the Neapolitan tradition of cuccagna- a festival celebrating a mythical land of food, where roast chicken rained from the skies and wine flowed in rivers. Learn how early modern Neapolitans built giant edible monuments to celebrate birthdays, weddings, and holidays, complete with fortresses of ham, bell towers made of cheese, and lakes of beer! Was it all in good gluttonous fun or did the festival have a deeper political purpose? We'll also speak with Dr. Alan Darr at the Detroit Institute of Arts, where you can see relics of these early modern feasts at the Edible Monuments Exhibition, on until April 16th. Numerous prints and drawings from the medieval and early modern era depicted the mythical land of Cockaigne (or Cuccagna), where food and drink could be found everywhere and anywhere. Below is a 17th century Italian etching of the land where the lazy and the greedy were rewarded. Each section of the etching depicts a different feature of the mythical land, from rain showers of pearls & diamonds (upper left hand corner) to roast chicken (upper right hand corner). In the center is the Cuccagna prison, the punishment for those 'who wish to work'. Italy wasn't the only country to feature a mythical land of food. A century earlier, the Dutch master, Pieter Brueghel, captured the excesses of Cockaigne in his eponymous work. Look out for the roof of cakes on the left side of the painting, and the half-eaten egg, complete with fork, running between the blissed-out eaters. Pieter Brueghel the Elder, The Land of Cockaigne (Das Schlaraffenland), 1567. By the 18th century, cuccagna or edible monuments, built to honor a ruler's birthday, marriage, or other celebrations had grown giant. Popular throughout Italy, the tradition reached its peak in Naples. Neapolitan crowds were often invited to "attack" or destroy the monument in front of honored guests. Below are some examples of edible constructions that were captured in festival books at the time. 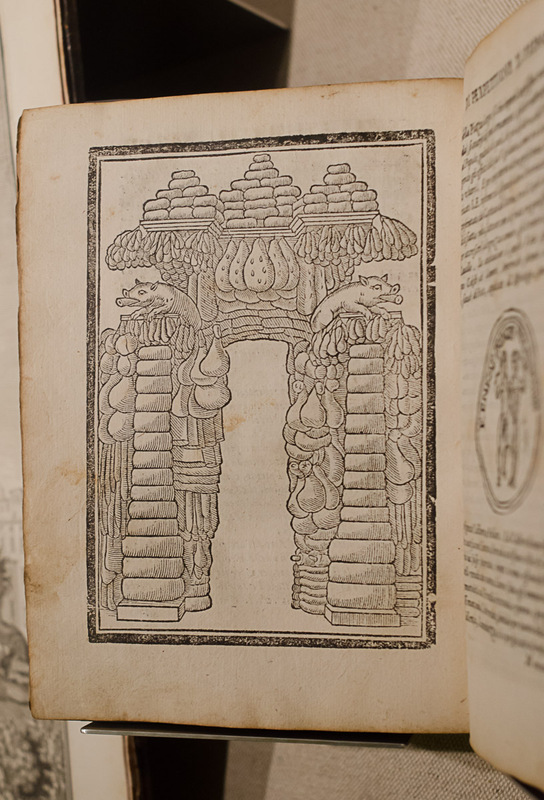 The Edible Monument includes about 140 prints, rare books and serving manuals from the Getty Research Institute collection and private collections. The artworks illustrate in lush detail the delectable monuments and sculptures made of food that were an integral part of street festivals as well as court and civic banquets in Europe in the 16th to 19th centuries. The exhibition has been organized by the Getty Research Institute, Los Angeles. The Exhibition runs from December 16th, 2016 - April 16th, 2017 (Easter Sunday). Learn more about the exhibition & buy tickets to the DIA. Can't get to the exhibition? Buy the catalogue here! Edited by Marcia Reed, the organizer behind the Getty exhibition, The Edible Monument: The Art of Food for Festivals is a great collection of articles on feasting traditions in early modern Europe, including the cuccagna. Gabriel Guarino, "Taming Transgression and Violence in the Carnivals of Early Modern Naples" The Historical Journal 60,1 (2017), pp. 1-20. Alden Murray, "The Court and the Cuccagna" The Metropolitan Museum of Art Bulletin, New Series, 18:5 (Jan., 1960), pp. 157-67. Andy G. Cohen, "A Perceptible Shift" (A Perceptible Shift by Andy G. Cohen is licensed under a Attribution License). Philipp Weigl, "Subdivision of the Masses" (Subdivision of the Masses by Philipp Weigl is licensed under a Attribution License).